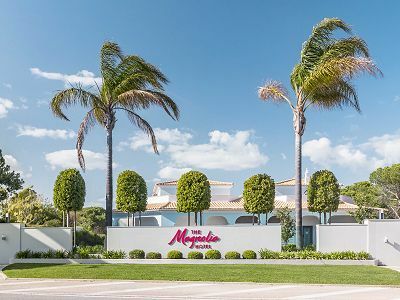 Beautifully surrounded by the sun-kissed Algarve coastlines, The Magnolia Hotel plays host to 74 rooms, 3 suites and 7 one-of-a-kind cottages just steps away from the Quinta do Lago resort. Here, guests can enjoy exclusive access to Quinta’s golf courses, luxury shopping, beach-life that rolls into night-life and don’t forget a visit to The Campus to complete your trip, Quinta do Lago’s premier sporting environment. Listed Golf Package prices at Magnolia Quinta do Lago already includes a 10% discount for booking at least 4 months in advance - for Nov 1, 2018-Oct 31, 2019. Listed Package Prices: Listed golf package prices apply for booking at least 4 Months in advance for Offer dates. 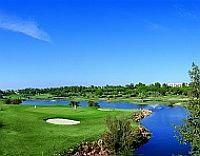 Listed Golf package prices at Magnolia Quinta do Lago include Hotel, Breakfast, Golf & Golf Transfers. Unwind in standard rooms – spacious & comfortable – with private balcony. All our bathrooms are fitted with a shower, vanity sink & mirror equipped with hairdryer, magnifying make-up mirror, and a pair of signature Magnolia slides for each guest. Enjoy the comfort of a stylish suite featuring separate living areas with couch. Bathrooms are fitted with shower, vanity sink & mirror equipped with hairdryer, magnifying make-up mirror, and signature Magnolia slides. Wood-cabin style cottages are a comfy haven complete with a spacious bedroom, lounge area, kitchenette, and private patio area. Bathrooms are fitted with shower, vanity sink & mirror equipped with hairdryer, magnifying make-up mirror, and signature Magnolia slides. Soak up the relaxed vibe of the Magnolia poolside restaurant and enjoy brunch, lunch or a candle-lit dinner. Enjoy the craft cocktail renaissance and escape the heat of the day with a delicious cocktail individually created for you by our team of in-house mixologists – enjoy at our indoor bar or poolside under the palm trees, the perfect way to top off your trip at The Magnolia Hotel. Outdoor Pool: Whether you are visiting in summer or winter dip make sure to visit the heated outdoor pool at Magnolia! Holistic Rooms: Hit the pause button and reconnect body & mind with our range of holistic treatments. Recharge & rejuvenate in the tranquil surroundings of our treatment rooms and let our therapists help your body and mind escape this busy world! Gym: Premium leisure facility kitted with everything you need for the perfect workout. Other leisure options include The Magnolia tennis court, Quinta golf courses and The Campus Athlete performance centre for a game of padel or enjoy a guided cycle leaving from The Bike Shed. The Quinta do Lago South championship course, set in undulating hills and pine forest, has hosted the Portuguese Open eight times. A truly wonderful course, ideally designed to test the scratch golfer but can also be enjoyed by the handicap golfer, the layout favours the long hitter but correct placement of shots is needed to score well. Strategic bunkering, occasional water hazards and large, contoured greens are the main challenges. The signature hole is the beautiful par-3 15th with a long carry (190 metres) over a large lake to a well-guarded green set amongst pine trees. Laranjal was originally an orangery but today is the third top class golf course at Quinta do Lago. The fairways are rolling and narrow with mature orange trees, cork and umbrella pines lining the edges. There are 5 lakes on the layout and the greens are planted with Penn A4 grass type to ensure excellent putting surfaces all year round. The North Course is the newest addition to Quinta do Lago’s five-star golf facilities, the totally revamped course has been one of the most talked about golf projects in 2014 and is set to be one of the new stars of European golf - and the new number one course at Quinta do Lago! Redesigned by renowned American architect Beau Welling in close collaboration with European Ryder Cup captain Paul McGinley, the new layout has been built to the highest specifications with a €9.6m investment. A low-cut Bermuda grass approach has been introduced around greens to create a myriad of recovery shot options for increased satisfaction on all levels of play. The aesthetics of the par-72 course have also significantly improved through the introduction of a cool season rough grass and the select planting of native grasses and specimen trees to help the environment. The Vale do Lobo Royal Course is rated as one of the best in Europe and sits dramatically on the cliff’s edge over the Atlantic. The famous 16th is one of the most photographed holes in Europe and requires a shot of more than 180 metres over three spectacular cliffs. The wind plays an important role and even long hitters frequently require a good one-iron. The Royal is a very enjoyable course, with attractive holes lined with umbrella pines and fig trees. A buggy is recommended, though, as there is a lot of walking between greens and tees.